As I said in my previous post, the living room is going to get a makeover, but for now this is how it looks. I love black and white, so I thought that would be timeless for this time of year. 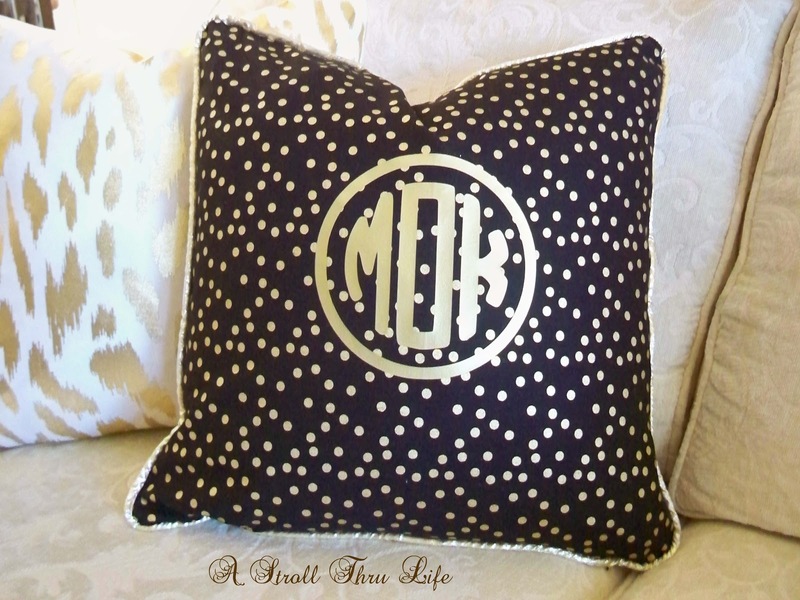 My new monogram pillow holds center stage on the sofa. If you missed it, you can see the tutorial on how to make one here. and the fur throw is resting on the ottoman. 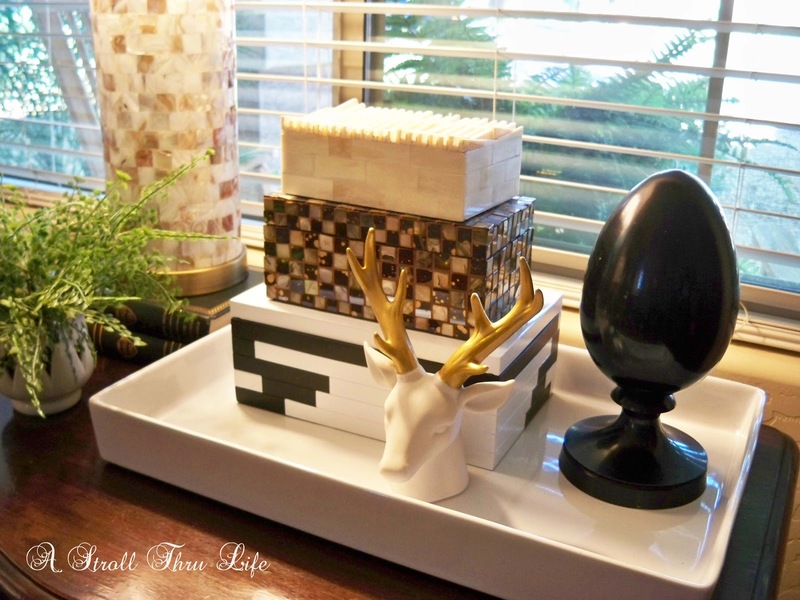 This gives the room an easy uncluttered look that I love after the Holidays. and the stacked boxes on the chest. A clean simple relaxing look. Stay tuned, this room is in for a dramatic change. New hardwoods are definitely going in, new paint and new drapes. Plus I am thinking about a cowhide rug too. Paint and new window treatments going in for the familyroom first, then on to all the floors. You guys are all super for giving me some advice about the hardwood floors, thank you so much for your fabulous input. I am going to bite the bullet and remove all the tile in the kitchen/breakfast area and go with hardwood throughout as one continuous flooring. It will definitely look the best and I know that is the look that I really want. I will just be careful to wipe up any spills or water in the kitchen. I know you guys are right and this will definitely be the best option. If you want to see everyone's comments, be sure to see my makeover post here. What a great look, Marty! I love black and white, too, and as you know have a black and white color scheme in our living room. I just love it and it is easy enough to add in other colors (especially red at Christmas and Valentine's Day). 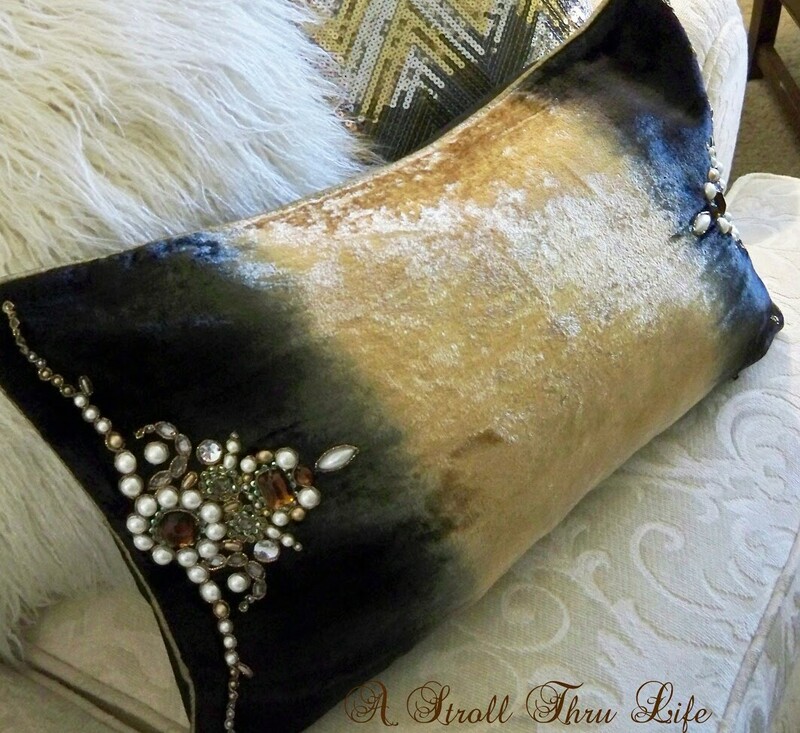 Absolutely love your new pillow on the sofa, it is stunning and really pops in that room. You did a great job as usual. 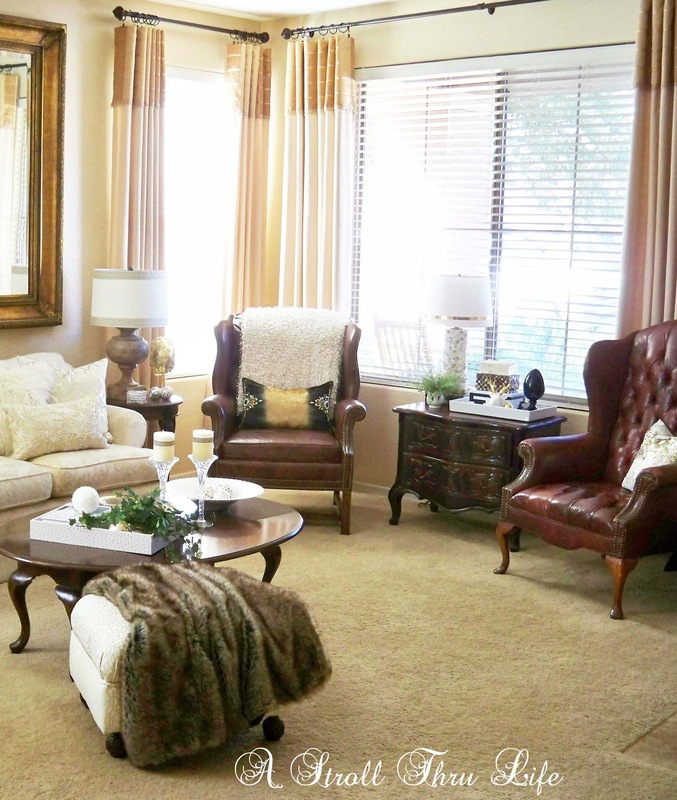 The room looks very classic, restful and beautiful, as is everything you do. Hope this find you well...........looking forward to seeing your new family room makeover. Looking good Marty. I love black and white. 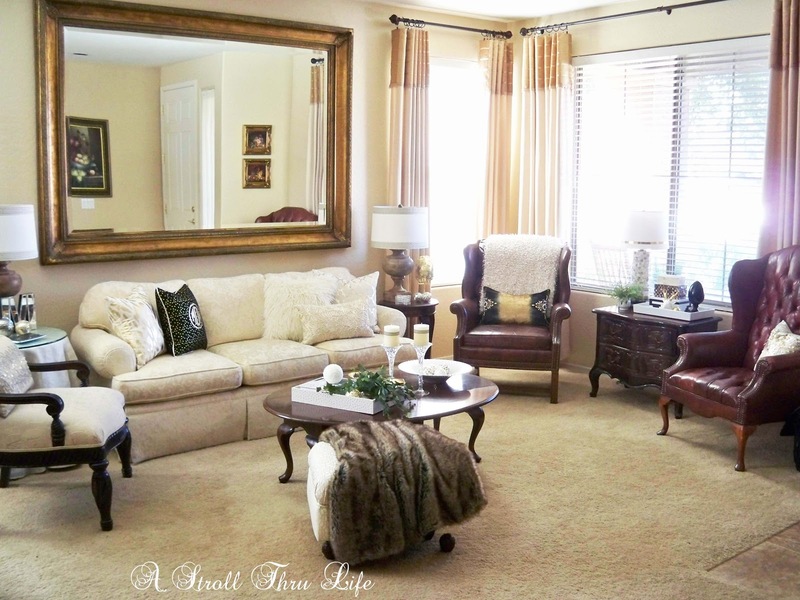 Having a light sofa lets you use so many different colors and looks. It looks fantastic Marty! Your living room is very elegant and you are an amazing interior decorator and I think it would have been your career at large! At least you give us so much ideas and inspiration through our little blogs. I Iove the black and white look. Beautiful Marty!! You are going to be so happy with your flooring decision...the hardwoods are going to look beautiful throughout! Love this look Marty! Clean and elegant. Excited to see your new floors and the area rug you will pick out. Marty, your living room is so pretty and elegant! 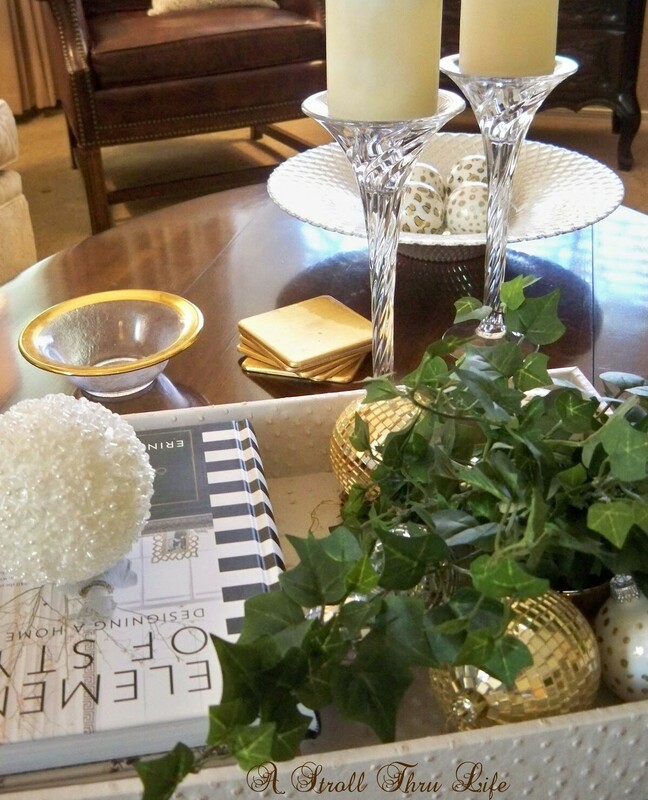 I love all the pops of gold with the black and white accents! You'll love your hardwood flooring- great choice! I can't wait to see this room when you finish! It looks great Marty. Glad you decided to do all wood through out. You will love the flow and the difference it makes in warmth. I have hardwood throughout my home and the kitchen holds ups really well. You will love it. 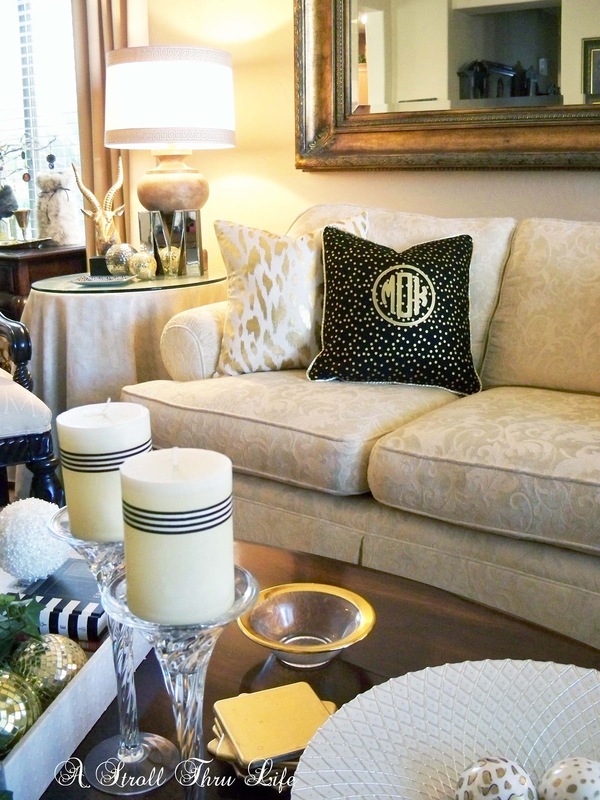 Love your winter living room and especially your black and gold pillow! Marty your house is so gorgeous. Your carpet looks like new. If I had that in my house oh boy it would be brown. 4 kids and three dogs and two cats. meantime your room looks very rich and stunning. I love all the texture you added for winter Marty, lovely as always! Your living room looks beautiful, Marty! You are such a great inspiration all year long! The room looks great! I love the pillow and the fur throw! Everything is beautiful Marty! Love all your accessories, especially that jeweled pillow. Thank you for sharing over at Vintage Inspiration Party. Your room looks so lovely and cozy... perfect for this time of the year. I am loving all the cute details around the living room. I can't wait to see how the space will change. 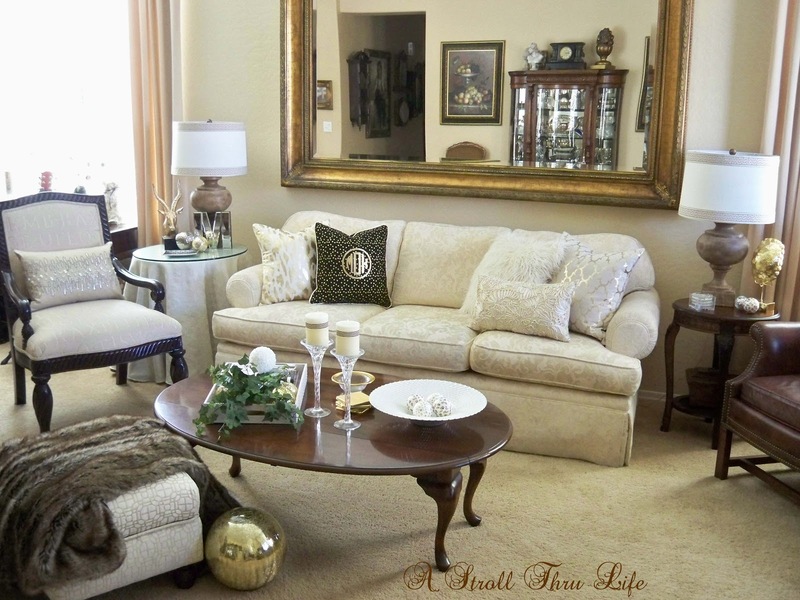 I am getting ready to redecorate my living room as well, however nothing major, just a few details here and there. Thank you for sharing.